If you’re looking for a game that’s unlike anything else you’ve seen before, put down the controller, put down the football and feist your eyes on the WILDEST game you’ve ever seen! Bubble ball soccer is taking the United States by storm and is showing no signs of stopping, with massive organizations like the National Association of Bubble Soccer setting up leagues and providers all across the country. If it isn’t in your city already, rest-assured it will be soon and when it comes your direction, it’s highly recommended to try it out. Essentially, the rules of soccer applies with one main difference, you’re able to hit other players in this full-contact sport! Teams usually range from 5-7 players per side and takes place on both indoor and outdoor fields. 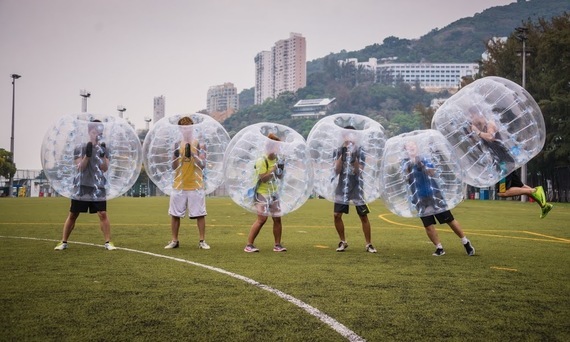 According to National Bubble Soccer, players are able to enjoy this sport as a one-time group rental arrangement or in their official league play, both available through their registration pages. But get ready to sweat, because not only is this game outright hilarious, apparently it’s a huge workout too! Popular in the United Kingdom and Scotland, bubble football took Europe by storm rather quickly in 2011-2012, which means the United States are actually pretty late to the party as European providers and league play is thriving. Probably the most viral and incredible sport we’ve ever seen, it’s almost certain that this sport is destined for television and a national championship of some sort. Could the Super Bowl have some competition someday? At the very least it could be a half-time event! Maybe even a way for Commissioner Goodell to make the NFL even safer for precious quarterback’s and wide receivers.